Recently a user posted a question about using the 'Go to Next State' command used in Advanced actions. You can read our discussions in this thread. Time to write out some tips for multistate objects. This blog wants to give an answer to the user, and has its focus only on that solution. I plan to publish more about the basics of states and their commands later on. To me personally the introduction of multistate objects is in the list of my favourite features in Captivate, closely following Shared/Advanced actions and Shape buttons. Watch this published rescalable interactive movie. The second slide has three shape buttons, navigating to three slides where you can read and confirm reading, or click hotspots, or answer questions. Each of your actions will result in changes to the progress bar on that second slide. Beware: whenever you have clicked an interactive object it will be disabled! You can add custom states to any object, static or interactive. In those states you can have many object types: graphics, video, audio... but no interactive objects nor hyperlinks. The Normal state is the default state, which will always appear unless you have changed to a custom state using a command (in a simple or an advanced/shared action). You have a lot of freedom for custom states: contrary to the InBuilt states, nothing is locked tto the default normal state. You can have objects in a custom state that are in a totally different position from the Normal state. Custom states are always controlled by commands, not by a situation. 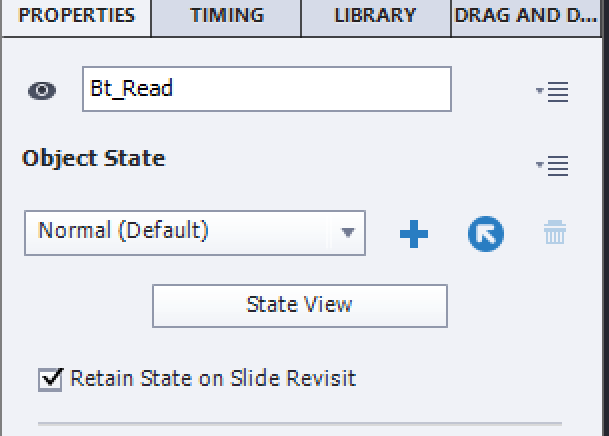 If you want a custom state to remain for future visits to the slide where the multistate object is sitting, you need to check the option 'Retain state on slide revisit'. All types of buttons Shape buttons, Image buttons, Transparent buttons and Text buttons. You have four of those styles: Normal, Rollover, Down and Visited. The first three are part of the button style. You don’t have the same freedom for location of those states, they are locked to the Normal state (look for the Lock indicator). I will only talk about shape buttons here. Contrary to custom states Inbuilt states appear automatically in a situation: when not hovering over button (Normal), when hovering over button (Rollover), when pressing button (Down) and when after clicking/tapping (Visited, if it has been created). You can only control Normal and Visited by a commandif necessary, not the Rollover/Down states..
Go to Previous State …..
Go to Next State …. When you use these commands as a simple action, from the dropdown list inthe Actions tab, they can only be applied to multistate objects on the same slide as the event triggering the action (Slide event, interactive button events) The Hypelink even thas only the first command (Change State). If you insert one of the commands in an advanced/shared action they seem to be able to apply also to multistate objects on other slides. That is indeed the case for the ‘Change State’ command, but is NOT functional for the commands Go to Next/Previous States. I have logged this as a bug, because you are able to choose multistate objects on other slides, however without any effect. That was the reason of the question in the forums, described in the Intro. You could see in the Example movie that I have a workaround. How? YOu will need one user variable v_counter, to track the number of clicks while being on other slides than slide 2 with the Progress indicator SS_Progress (a multistate object). This progress indicator starts with a Normal state which is a shape with Alpa and Stroke = 0. That variable starts with a default value = 0. The clicks on the OK buttons in slide 3, on the hotspots in slide 4 and on the correct answers in slide 5 do increment the variable, besides other commands. Example: if the user has performed 3 actions on any slide, v_counter would be 3. The while loop will then be done 3 times, which means the 4th state of the progress indicator will appear. At the same time, the variable will be set back to 0 at the end of the loop. The learner can continue to visit another slide, and the variable is ready to track again. This is just an example, many variations are possible. Maybe you want to allow visits and actions to consecutive slides before returning to the main slide, this can easily be achieved. Or have feedback appearing on the main slide after all slides have been visited, based on the obtained progress.. I didn’t explain all actions in this post. The slide with the hotspots is based on a recent article about Hotspots in a 2D image. Maybe you are wondering if I used the Visited state or a custom state for the OK buttons (slide 3) or the hotspots? What the quickest workflow is to create the states for the Progress bar? Did I use shared actions or advanced actions, and why did I choose that way? Why did I disable the buttons? If you are interested, I can explain… on demand.